While Armadillos are a wild animal and people should always be cautious with any wild animal, they are not typically a dangerous pest. They very rarely are known to attack humans or other animals, unless threatened. And while armadillos have been known to be carriers of the bacterium that causes leprosy it is highly unlikely that it would be passed to humans or other animals, unless you happen to eat an infected armadillo that is undercooked. 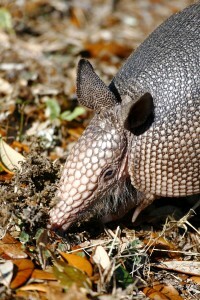 Armadillos do however love to dig in your garden, searching for insects or grubs. They also burrow and create tunnels and can cause severe damage to the foundation of your home within just a few nights. They are a major nuisance to any agricultural property as they have large claws and get through soft dirt very rapidly. Our Technicians are certified professionals who can remove the animals using the latest technology and equipment, as humane and gently as possible. We can repair any damages caused by armadillos, as well as clean, deodorize and disinfect any effected areas of your home or business. In addition we can provide preventative services to stop future infestations of wildlife or pests, be it armadillos or other animals found in nature.